Overview - Paul Kemp is a freelance journalist who finds himself at a critical turning point in his life while writing for a run-down newspaper in the Caribbean. Paul is challenged on many levels as he tries to carve out a more secure niche for himself amidst a group of lost souls all bent on self-destruction. One of the most difficult things for any burgeoning writer to accomplish -- is to truly find their voice. To truly discover and cultivate their own distinct style, their own singular perspective. It's one thing to have a lot to say, but it's another to actually find the right way to say it, and the journey to this realization can be long and hard. 'The Rum Diary' follows one man as he embarks on such an adventure, slowly heading toward an artistic epiphany that will eventually send shock-waves of ink and rage throughout the world of journalism. Culled from the creative mind of Hunter S. Thompson, the film is a humorous examination of corruption, creative growth, and the various effects of rum. Lots and lots of rum. Unfortunately, despite a certain comedic charm, the movie ultimately fails to push far enough with its satire, resulting in an unexpectedly predictable, but still entertaining effort. Based on the novel of the same name written by Hunter S. Thompson, the film follows the exploits of a young journalist named Paul Kemp (Johnny Depp) who serves as a loose stand in for the author himself. After getting a job for a local paper in Puerto Rico, Kemp slowly grows accustomed to his rather eccentric surroundings. During his time on the island, he befriends a corrupt businessman, Sanderson, (Aaron Eckhart), and is soon asked to write up a fluff piece that would paint the tycoon's dirty land deals in a positive light. Unsure how to proceed, matters are made even more complicated when Paul starts to develop feelings for Sanderson's beautiful girlfriend, Chenault (Amber Heard). Frustrated by the injustices that surround him, and fueled by a seemingly endless supply of rum, Kemp gradually forms a plan to fight back, but the seedy realities of greed might prove too strong an enemy to withstand. A true passion project for the actor, Johnny Depp literally carries the picture. Picking up on similar beats from his role in 'Fear and Loathing,' the performer once again steps into the shoes of Thompson's alter ego. Unlike the balding, nearly incoherent Raoul Duke, however, Paul Kemp is a much more cohesive, refined, and dare I say sober protagonist. With that said, Depp still gets plenty of opportunities to unleash some rum induced mayhem, and the character's various expressions and reactions to his increasingly elaborate predicaments are quite entertaining. One particular image that involves the writer bumping up and down in a car still manages to make me chuckle as I think about it. Joining Depp in his various mishaps are Michael Rispoli and Giovanni Ribisi, who both play other peculiar characters that work at the Puerto Rican newspaper. Together the three oddballs form a bizarrely amusing and often erratic trio. The gorgeous Amber Heard is also thrown into the mix, fueling most of the drama as Kemp's love interest while bringing some sizzling sensuality to the screen. Aaron Eckhart is appropriately unsavory as the story's antagonist, giving a deceptively friendly face to all of the world's greedy bastards. The always reliable Richard Jenkins rounds out the cast, in a fun but slightly underutilized role. Mostly episodic in structure, the film is full of faintly satirical situations and characters that focus on themes of materialism, corruption, greed, and the slow death of the American Dream. While all of these concepts are interesting, the filmmakers rarely delve deep enough into the subject matter they're examining, and the loose narrative leaves many plotlines underdeveloped. Various, humorous detours involving slightly exaggerated, absurd misadventures are all entertaining enough, but the overall experience just feels a bit restrained, uneven, and unsatisfying. Several of these shortcomings seem to stem from the very nature of the story itself. In many ways the film ends up becoming the equivalent of a comic book origin story, revealing how Thompson evolved into the gonzo journalist we all revere him as. The character's entire arc hinges on him discovering his unique voice, and as such, that voice is sorely missing from the majority of the running time. Sure, there are occasional bursts of classic Thompsonisms, with biting cynical observations thrown in here and there, but by and large many of the elements that make the author and his work so appealing in the first place, are completely absent. On that same note, though writer/director Bruce Robinson does a decent job, he fails to really capitalize on the few moments that do evoke Thompson's trademark style, leading to a surprisingly straightforward movie. In fact, the whole affair ends up coming across as oddly conventional. 'The Rum Diary' tells the story of one writer's artistic awakening toward a revolutionary new voice. Unfortunately, the spark of genius that permeates most of Hunter S. Thompson's work is only just starting to form here, leaving the film feeling a little lacking. Still, this is far from a bad flick, and there are some truly entertaining performances and situations peppered throughout. Depp's passion for the project is evident in every frame, and though light on Thompson's trademark insights, there is enough value here to warrant a look. 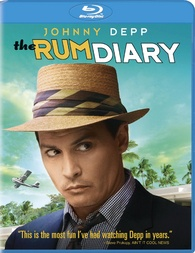 Sony brings 'The Rum Diary' to Blu-ray on a BD-50 disc housed in a keepcase. After some skippable trailers the disc transitions to a standard menu. The packaging indicates that the release is region A compatible. The movie is provided with a 1080p/AVC MPEG-4 transfer in the 1.85:1 aspect ratio. Though a bit uneven, this is a solid transfer that handles the film's intended look well. The 16mm source is clean with some light to moderate grain visible throughout. Clarity is good, especially in close-ups and brightly lit scenes. With that said, many sequences feature a fairly soft appearance with indistinct fine details in wide shots. Several outdoor scenes provide a bright, colorful picture that shows off the film's island setting with rich hues (the opening shot which follows a red plane over the ocean is a real highlight). Contrast is also nice in these instances, bringing a decent sense of dimension. Indoor sequences, however, carry a murkier, often dim quality with low contrast and a less enticing palette. Black levels are mostly deep, but can appear a hair elevated in some nighttime shots. 'The Rum Diary' looks just fine on Blu-ray, with no signs of unnecessary processing or artifacts. The 16mm cinematography doesn't exactly lend itself to impressive amounts of detail, but the resulting picture faithfully reproduces the movie's intended aesthetic. The audio is presented in an English DTS-HD MA 5.1 track with optional English, English SDH and Spanish subtitles. With pleasing fidelity and decent immersion, this is an all around quality track. Speech is clean and full throughout. Effects and music are spaced nicely around the room with appropriate surround use when called for, giving the island setting some welcomed personality. Bustling protests, chaotic cockfights, and a carnival celebration provide a few of the film's more lively moments, breathing sonic life into the eccentric atmosphere. Dynamic range is distortion free and there is some good bass response in the movie's score and a few of its more dramatic scenes. Balance between the various audio elements is handled well with dialogue prioritized nicely. Several stretches of the film tend to hover on the quiet side, but the mix effectively enhances the mood with modest but still enveloping sound design. Sony has put together a slim set of special features, but the included documentary is actually very interesting. All of the extras are presented with Dolby Digital 2.0 sound and optional English subtitles. A Voice of Ink and Rage: Inside the Rum Diary (HD, 13 min) - Presented in 1080p, this is a decent behind-the-scenes look at the production with the usual mixture of on set footage and cast and crew interviews. The source material is briefly addressed along with details on the adaptation process, production design, visual style and challenges encountered during shooting. Depp and Thompson's close friendship is also discussed, and it's clear that the whole undertaking was a real labor of love for the actor. Though short, this piece does offer a bit more substance than usual promotional featurettes. The Rum Diary Back-Story (SD, 46 min) - Included here is an extremely interesting and very intimate look at the movie's troubled development history. Filled with footage of Thompson himself, dating back from 1998 through 2002, the documentary chronicles the novel's publishing with several fly-on-the-wall meetings between the author and his editing team as they refine and revise old drafts. From there, the piece goes on to follow Depp and Thompson as they try to get the film adaptation funded, leading to a rare, firsthand glimpse at the glacial horror that is the Hollywood deal making process. Littered with wonderful bits of Thompson's mumbled insanity, this doc is a real treat for fans of the author. With 'The Rum Diary,' Johnny Depp returns to the chaotic world of Hunter S. Thompson, resulting in an entertaining but decidedly mixed experience. Paul Kemp's journey toward artistic awakening is interesting, but the whole endeavor proves to be surprisingly conventional, mostly lacking the spark that makes Thompson's work so appealing to begin with. The video transfer is authentic but a little underwhelming, and the audio mix does a nice job of enhancing the visuals. Unfortunately, there isn't a whole lot offered in the way of supplements, but the included documentary on the movie's long development is fascinating, with lots of great interviews and footage of the late author in action. Though the film isn't completely successful, it still offers a fun experience, and with its solid technical presentation, this disc is certainly worth a look.